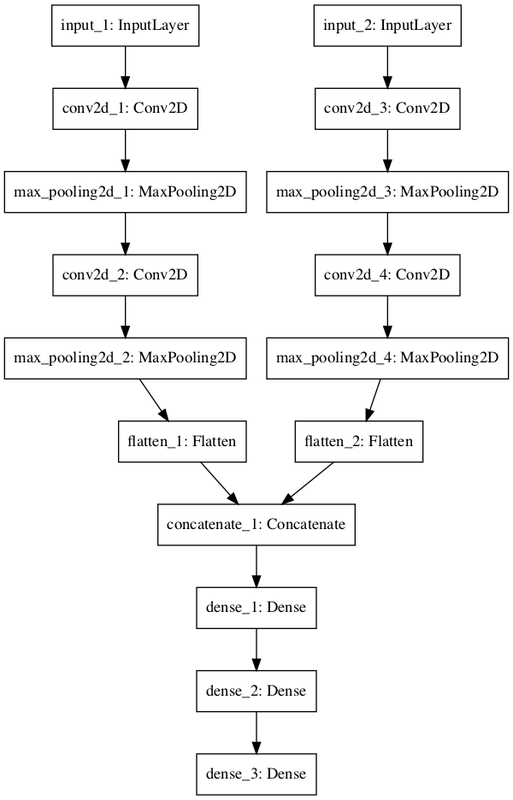 I am beginner in deep learning and I want to create a multi-input Convolutional Neural Network (CNN) model in Keras for Images Classification. I am working to create a CNN model that takes two images and gives one output which is the class of the two images. I have two datasets: type1 and type2, and each dataset contains the same classes, but the number of images in each class in the dataset type1 is higher than the number of images in each class in the dataset type2. The model should take one image from Type1 dataset and one image from Type2 dataset and then classify these images to one class (ClassA or ClassB or------). The following is the structure of the datasets. The model is very similar to the model in this images, but it has more layers before flatten layer. I created a custom generator that inputs two images (from type 1 and 2), and each image from type1 be paired with every images from type2 as long as these images belong to the same class (label). Found *** images belonging to 100 classes. Could you please help me to solve this problem and create the custom generator?? Browse other questions tagged python neural-network deep-learning keras tensorflow or ask your own question. What is the best deep learning architecture for image classification with different intra-class variances? How to train a multi inputs deep learning model using every combination of inputs?